The Dovecote is a romantic hide-away in the stunning Wye Valley. 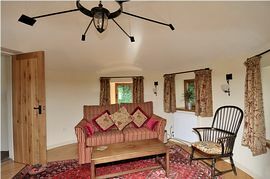 It sits on the side of a beautiful valley near the River Wye, and provides an idyllic base for some exceptional walking, cycling, fishing, canoeing and other outdoor activities. A renowned real ale pub is a ten minute walk down the lane. You will awake to a dawn chorus from every type of woodland and meadow bird, and will be able to step out across your drawbridge onto wild flowers: daffodils, moon daisies and bluebells in season. Your hideaway is enveloped by ancient woodland, teeming with rare British wildlife. 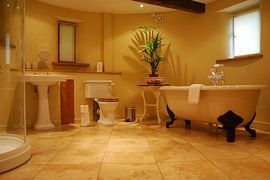 Luxury accommodation for two in the elegantly furnished main bedroom. The lounge has a comfortable sofa and views over the Wye Valley. 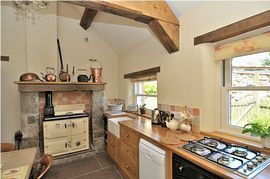 Large, oak-beamed kitchen with traditional range, electric oven, gas hob and large dining table. Sumptuous bathroom with separate shower, roll-top bath and garden views. 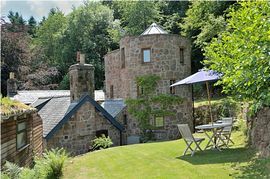 Enjoy the tranquillity of the enchanting three-storey dovecote, a unique round tower tucked away in the picturesque lower Wye Valley. Visit the Dovecote's website for availability details. Garden furniture and patio,bridge out onto large garden, meadow and woodland. Local Services: Real ale pub serving food, ten minutes walk. Village post office and general store with newsagent 15 minute walk. Reasonable local buses. From £320.00 for a winter week to £650.00 per week in Peak Season. A week over New Year is £650.00. 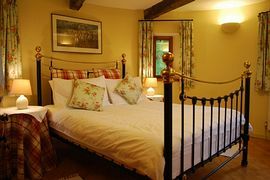 A long weekend in winter is £270.00 (for up to four nights). Please visit our website, telephone or email for a quote for your chosen week. Open all year round. Saturday changeover.